The Academic Club works to promote intellectual growth and enhance the networking skills of the students. The club hosts many activities and events at the Intra and Intercollege levels all round the year. These include guest lectures, workshops, discussions, academic quizzes, PPT presentations, exhibitions, competitions and extracurricular programmes. The Academic Club of the college places special emphasis on promoting a way of learning outside the classroom. SESSION ON WOMEN SECURITY : An informative session on "Women Security" was presented by the "Anti-Romeo Squad", functioning under the Police Commissionerate, Jaipur, in order to make the students aware about the prevention of eve-teasing and other crimes against women. The Lady Police Patrol unit also gave a brief about the 24x7 Garima Helpline No.-1090, WhatsApp Mahila Helpline No.-8764868200 and about the Rajasthan Mahila Suraksha Mobile App. ART EXPRESS : A two-day event "Art Express"was organised in the college which comprised many activities like Mehandi Art, Stone Painting, Face Painting and English and Hindi Self-Composed Poem Recitation and Extempore Speech. CHANGING MINDSET PROGRAMME, I CREATE : The college organized a five-day workshop on entrepreneurship development-"Changing Mindset Programme" in collaboration with I Create, Rajasthan. The resource persons for the event were Dr. Ranju Mehta, Director, I Create, Jaipur and Vice Principal, Kanoria P.G. Mahila Mahavidyalaya, Jaipur; Mrs. Hema Chawla, Programme Coordinator and Master Trainer at I Create; Dr. Shipra Vajpayee, real-time entrepreneur and Ms. Divya Shekhawat, Owner Choco Cheri, Jaipur. Final presentations by the students were judged and awarded. The eminent judges included Col. V.K. Kapoor, Founder Director, I Create Rajasthan and the National Advisor at I Create. PHOTOGRAPHY COMPETITION : A two-day photography competition "Campus through Your Lens" was held in the college wherein students captured the college photographs in their own style. The competition showcased the innovative insights of the participants who captured images of the premises on a completely new and different scale in their photographs. ULLAS : Youth Festival "ULLAS" was organized in the college and included solo dance and group dance competitions. The esteemed judges for the event were Ms. Anita Pradhaan, who has acted in TV serials and in the acclaimed Hollywood film "Little Buddha"; Ms. Namita Jain, 'Nipun' and 'Alankar' in Kathak and Ms. Veena Modani, a singer, dance choreographer and performer at the National and International level. She has been awarded by the Hon'ble Chief Minister of Rajasthan, Ms. Vasundhara Raje, for Women Empowerment and is known as the "Asha Bhonsle" of Rajasthan. 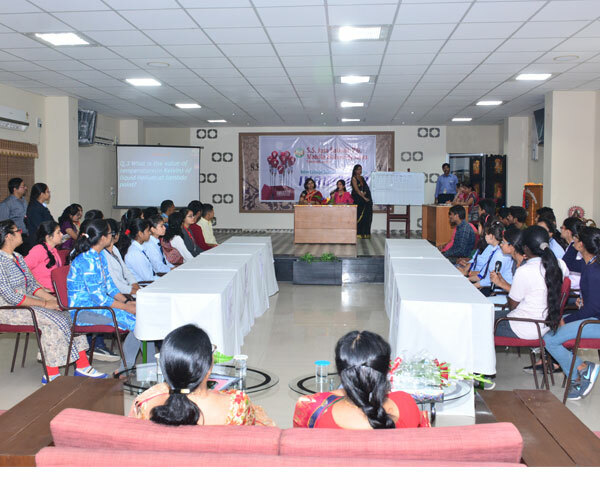 WORKSHOP BY RUWA : The college organised a workshop by “Rajasthan University Women's Association (RUWA)” on "Democracy and Constitution". The guest speakers were Prof. Asha Kaushik, Dr. Rashmi Jain and Dr. Amithy Jasrotia. The lecture highlighted many issues related to democracy and enriched the knowledge of the students who attended the session. INQUIZITO : Intercollege Science Quiz Competition "INQUIZITO" was held at the college and saw the enthusiastic participation of students from various reputed colleges. Dr. Satyabhama Gupta, Prof. in Chemistry, Kota University was the esteemed Guest. PINNACLE : The Annual Prize Distribution Ceremony 'PINNACLE' felicitated the meritorious students of the college and honoured our Eleven Subodh Manishis, who secured prestigious positions in the University of Rajasthan Merit List Exam-2017. The ceremony also witnessed dance performances by the students. WORKSHOP ON PHOTOGRAPHY / CINEMATOGRAPHY AND FILM MAKING : A one-day workshop on Photography / Cinematography and Film Making was conducted by Prof. Shashi Sahay, Senior Mentor and Consultant of Zee Institute of Media Arts (Zee Studio) in order to help students explore exciting career options. COMMATHON : A two-day Intercollege Commerce Fest "COMMATHON-2017" was also held during the session. It witnessed many students from different colleges showcasing their skills through Power Point Presentations, Group Discussion, Quiz, Business Plan, and Ad-Making and Poster-Making Competition. The eminent judges were Dr. Naveen Mishra, Advocate, High Court and Vice President of Human Rights Commission, Jaipur; Dr. Neha Khatri, Subject Expert E.A.F.M. ; Ms. Hema Chawla, Programme Coordinator and Master Trainer at I Create and Ms. Neetu Jain, a well known designer and entrepreneur.